Being the leader is a big job. Most if not all of us know that. Being the leader to Geeks, or being a leader and a Geek is an even bigger task. However, finding that specific person , or group of people that could be the future leader, and then mentoring them to make them into leader material; this could be a lot on someone’s shoulders. This is not something to take lightly, especially when being a manager is a decent sized job on its own. Probably the biggest factor in this equation is trying to find the people that could be the person for the people. you can’t just go off of what you may think would be a good trait for the job. You have to look for specifics. you have to know certain traits that would make a person good for mentoring to be a manager, and then you have to know how to handle them. What I mean is you have to know how to help them, how to mold the into manager material. Like it says at the beginning of the blog, you need to know who to pick for mentoring and how to pick them based on what you see. The Geek Leader’s Handbook had some helpful guidelines to help out in with this. You as the leader need to avoid certain traits and gravitate towards others. For example, you don’t want to mentor someone who has a dominant personality, or is a techy genuis. Just because people are good with technology, or have a certain desire to lead doesn’t mean that they are cut out for the job. What leaders should look for in the person they want to mentor is someone having emotional flexibility, like knowing how to keep the positivist, the calm, and the communication on a balanced level. Yes, these may have to have a little molding to them so that it is understood just how to handle the people that they may handle when they become manager. Now, the fun part: actually mentoring the person you picked. It is probably in the best interest for literally everyone if you get to know this person in the time that you are mentoring them, otherwise things could get hairy. You will find out some need to know things about your person, such as , are they actually making plans about this job, do they understand at least something about what they might be doing, is this even what they might like to do with their life? After this step, you must ease into the training. A person that is being mentored cannot be spoon feed a crap ton of information on the first day. They will be overloaded and more than likely feeling more lost than a child at a carnival. Gradually walk into just about everything with your person to make sure they aren’t being overloaded and be patient with them. Try not to get distracted, or seem overly humble with the person. Also, avoid trying to mold the person that you are mentoring into another you, because that won’t work. 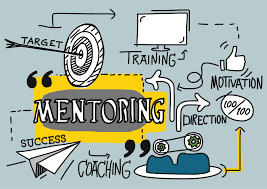 While researching more ways that are effective in trying to be a good mentor, and making sure that your person that you’re mentoring will be a good candidate, I found some tips on how you can be a good mentor to a future leader. Of course, you need to make sure that you communicate that communication is key in any position in the business, especially in a management position. It is also kind of important to make sure that you give them some advice from your experience as a manager. Don’t try to make them be like you, but give them some advice that you had to learn. Things like this need to be taken into consideration when you start mentoring people. For me, I don’t know if I have ever actually mentored people, but I did have to help people out in band when I was in high school. I had to teach people how to play the drum set and make sure that they had an idea of what they were doing so that they could take over when the older kids left. I had to teach them some techniques so that they wouldn’t hurt themselves while playing, and so that they would sound good when they did. I had to do this as soon as we started playing pep band, and usually, you can tell when people practice and when they don’t. You can also tell if it comes natural, or if they have to work at it. I do find it funny when you get the guy that thinks that he can do it all and sound like the drummer from Slipknot, when in reality, he could barely make it in the high school pep band games. I just tried to work with them the best that I could and give them as much advice as I could without overloading them, and that is what people need to remember when they mentor others. Do it right the first time so that you don’t have to clean up a giant mess in that department, and don’t think that you have to rush rush rush. That is never a good thing to do to the new guy/girl.